Samsung is a company that is no stranger to industry firsts, and they can add another feather to their already burgeoning cap with the introduction of the first NFC (Near Field Communication) enabled color laser printer in the industry, alongside a bunch of other multi-function printers. The new printer Xpress C410W series will comprise of the C410W color laser printer, the C460W color laser MFPs that boast of print, copy and scan functionality, and the C460FW color laser MFPs which come with print, copy, scan and fax capabilities. These C410W series were specially designed by targeting home and small office environments, where folks in these two areas have the tendency to print content straight from their smartphones. It is said that these three models would be able to print up to 18 pages per minute (ppm) in black and white, although if you decide to roll out your images in color, the speed would be greatly reduced to just four ppm. It can be said that printing itself has become a whole lot easier, where the Xpress C410W series would be able to hook up sans wires with mobile devices, delivering a fast, integrated and convenient printing experience whenever you are on the go. All you need to do is tap your smartphone on the printer, and printing will commence almost immediately. Should you want to scan and fax documents, that will not be too difficult either, since users can synchronize the contacts on their smartphones with the printers. The use of the Samsung Mobile Print App would pave the way for users to print everything from PDF files to Microsoft Office documents (Excel spreadsheets and PowerPoint presentations included) straight from your smartphone. What happens if your smartphone does not have NFC capability? Fret not, since you can still take advantage of Google Cloud Print, which enables you to print over the web regardless of where you are with the help of a smart device (smartphone or tablet). 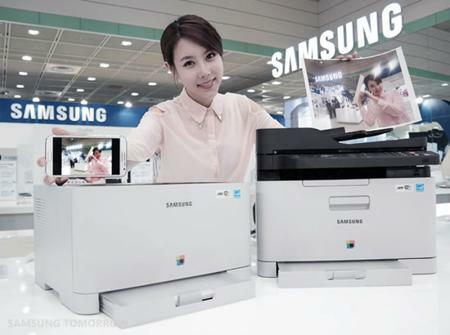 It certainly seems as though Samsung has a potential hit on their hands this time around with the new printers. I want to have this especially the brand! Hope I can afford it so…..